Cat, Dust Mite, Grass Pollen Allergy? Test yourself at home now! 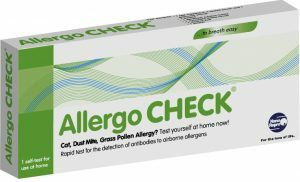 AllergoCHECK is a rapid test for the detection of allergy antibodies to cat hair, grass pollen and house dust mite. With AllergoCHECK you can quickly and easily determine at home if you have increased susceptibility to allergy. The test is designed to detect IgE antibodies in the blood. Each kit contains everything necessary for the test performance: an instruction leaflet, a sterile finger lancet, a blood tube, a developer solution and a test cassette. The positive result can be read within 15 minutes. Sneezing, runny nose, itchy eyes are not always the symptoms of a cold. Often it is an allergic reaction to something in the air. There are three most common airborne allergens, such as cat hair, dust mite and grass pollen. Worldwide, airborne dust causes the most problems for people with allergies.